SFMTA unveiled a proposal last week to redesign northern Sixth Street by trimming traffic lanes from four to two, widening sidewalks, and adding unprotected, green-painted bike lanes. Intersections on the stretch between Market and Howard Streets could also get features like raised crosswalks, speed tables (like speed bumps, but wider), and textured pavement to tame driving speeds. “This is super exciting,” said D6 Supervisor Jane Kim. While the plan already calls for converting many curbside parking spots to pedestrian space, Kim would like to see the plan for Sixth go farther, especially between Market and Mission Streets, because residents complain that parked cars are often used to obscure illegal behaviors like drug dealing. “Our residents don’t have cars, so they don’t feel the need for the metered parking,” she said. Adam Gubser, project manager for the SFMTA, said environmental review on the project is expected to begin in January, which will flesh out how the redesign would affect street safety, car congestion, and the diversion of traffic to other streets. That process is expected to take 16 to 18 months, but there’s no firm construction timeline set yet. When asked about including parking-protected bike lanes in the plan, SFMTA planners said the unprotected lanes in the proposal should be sufficient since traffic will be calmer and much of the lane will be curbside. They also said greater separation from motor vehicle traffic could potentially be added in the future if more parking is removed on Sixth. 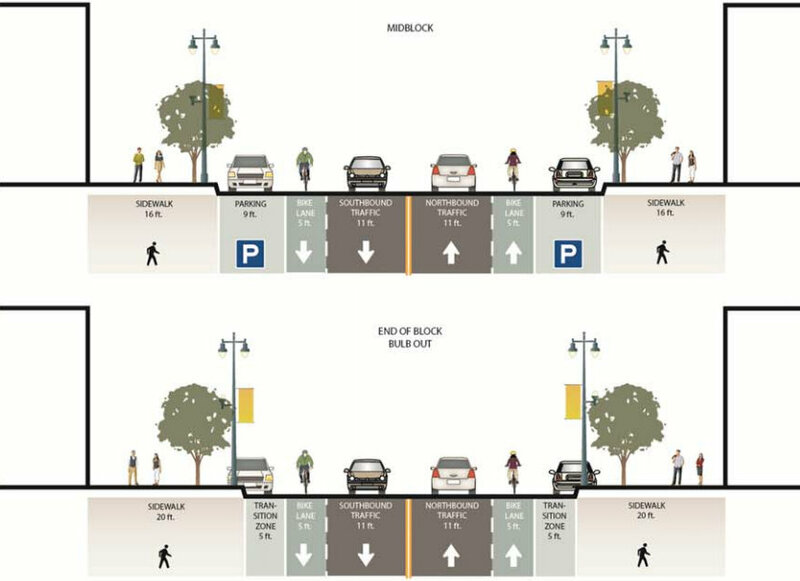 In the meantime, Gubser said the SFMTA will develop streetscape improvements to make the existing sidewalk space more attractive, including the installation of new lighting fixtures. Earlier this month, the agency installed the city’s first painted sidewalk extensions. 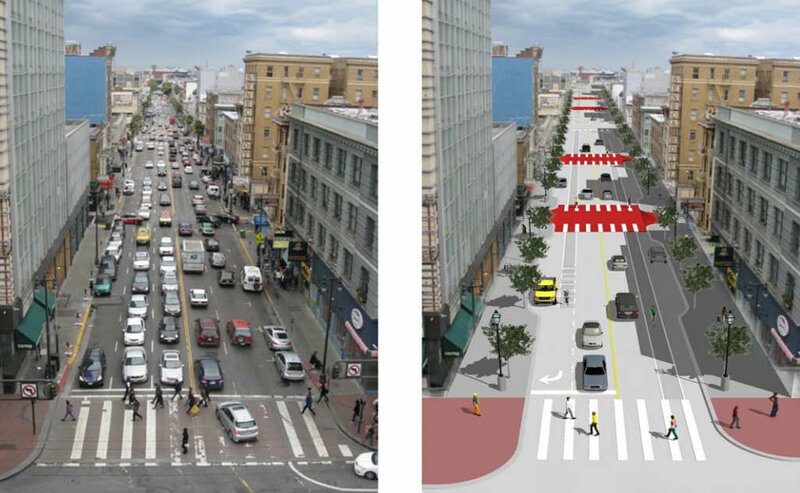 See the SFMTA’s presentation on the project here [PDF]. Paramedic on an electric-assist cargo bike. I love reading the “design by committee” comments on Streetsblog. Oh, wait, nevermind. I bike, but I readily admit that it’s not for everyone. Transit should be the absolute priority of the city if it wants to substantially decrease car usage. Yes! The Dutch faced the same problem and this solves it (with some consequences). I ride most mornings to with in SF and the inability of cars to safely turn right with a bike lane is obvious at every intersection. The current solution SFMTA uses for bike and car lanes at intersections is just not safe. When I drive a car, even though I know about bikes and their lanes, it is still hard and potentially dangerous to merge into the bike lane and turn. I strongly urge a grass roots movement to favor this design. Let’s get a pilot project built and see what it is like. This weekend well for the lane between intersections and easily married with the “Dutch solution” (above) for the intersections. How could we go about getting a pilot project built? I’m just an average guy (not in urban planning careerwise) who happened to live in the Netherlands, saw the light, and would love to see those kinds of implementations adapted here. That being said I’d love to help out however I could. (last two renderings on the page). Do you mean a trial/pilot kinda like this, done in a large test area like a parking lot to demonstrate its efficacy? Can we get SFMTA to listen? In the absence of being able to truly implement a trial on a real street is there any way we can do a pilot version of this kind of street à la the Berkshire roundabout trial in the UK? (http://www.cycling-embassy.org.uk/news/2013/04/30/trl-trialling-dutch-infrastructure-on-behalf-of-transport-for-london). I’m not an urban planner but still I’d like to somehow transition from being an armchair internet commenter to actually trying to work towards some kind of “active activism” (for lack of a better term) towards demoing this kind of solution if I can ever help in some way. 5′ space between parked cars and sidewalk > 5′ space between parked cars and moving cars. A Class II lane looks more spacious but all too often is rendered useless by double parking and, well, moving cars. Even when the moving cars are behaving exactly as they should the design is fundamentally flawed and unsafe for bike and car users. That being said, I think the solution quinine bubbles came up with to join those individual 5′ tracks as a united two-way cycletrack helps solve the width/buffer problem. I really like what quinine bubbles has done if you scroll down further on the page. Will Deadly Sixth Street Finally Get the Pedestrian Safety Fixes It Needs?